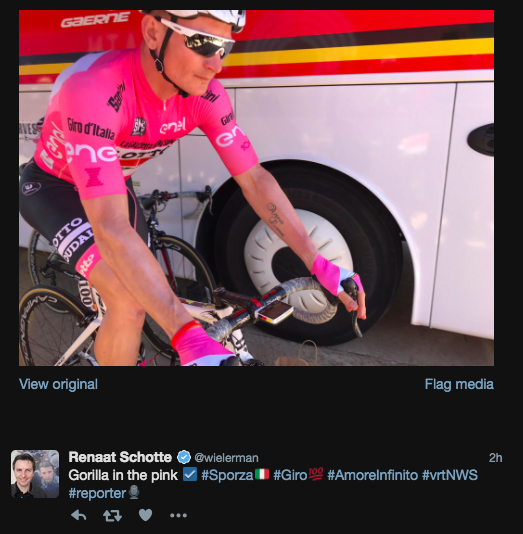 The first of our annual Giro Tweets of the Week – and we’ve gone all international! 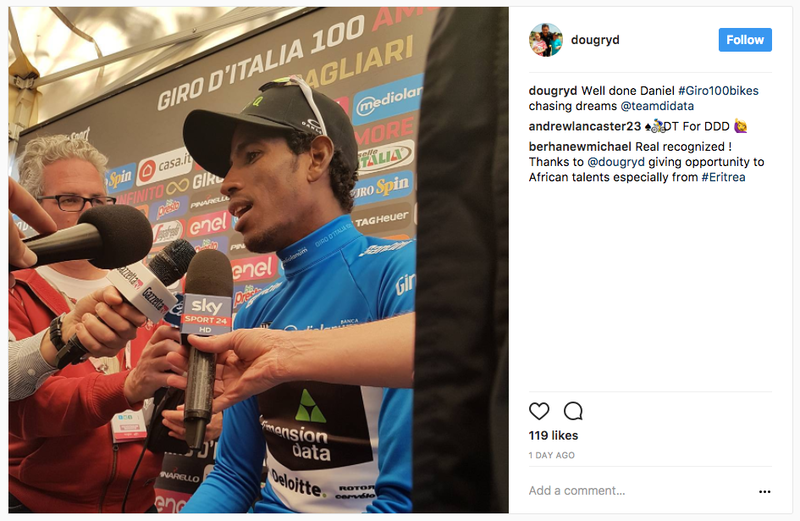 Austria, Eritrea, Germany, Colombia – and a polyglot gruppetto. 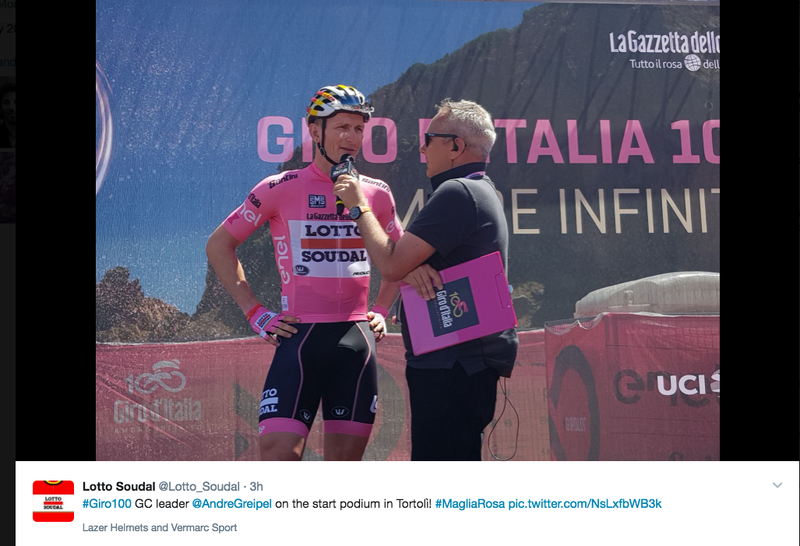 Lukas Postlberger took the first pink jersey of #Giro100 and is the first Austrian to wear the pink jersey. 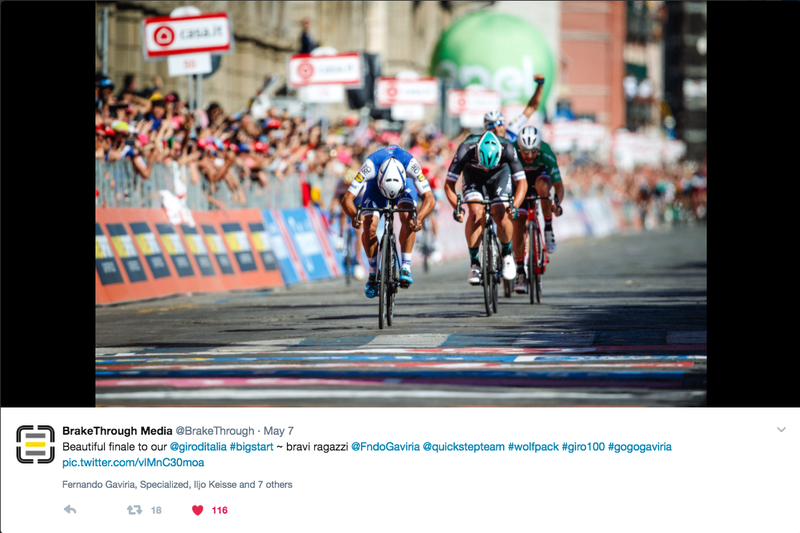 "And may I present my team"
Andre Greipel and Grand Tours definitely go together – winning a stage in each of the last 12 Grand Tours he’s ridden, he finally takes a leader’s jersey. The ever-elegant Daniel Teklahaimanot has fans wherever he goes. We love Team Dimension Data here at VeloVoices Towers. Last year, the riders had handmade bracelets from kids who received bikes from Qhubeka. This year, they were given handmade blankets – I love this! 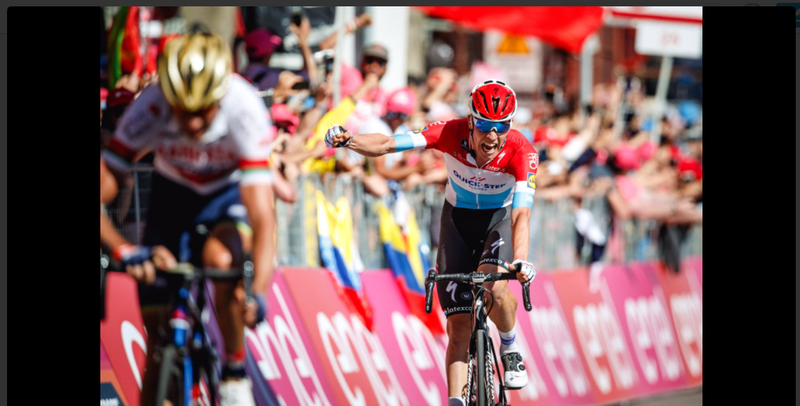 Bob Jungels helped set up Fernando Gaviria for a sprint win – and the chance to take the pink. 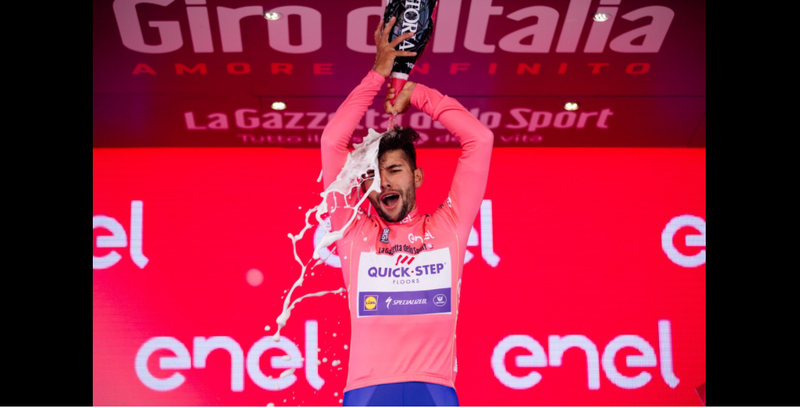 Brake Through Media are always where the action is and here is a mini-gallery of Gaviria’s win on Sunday. 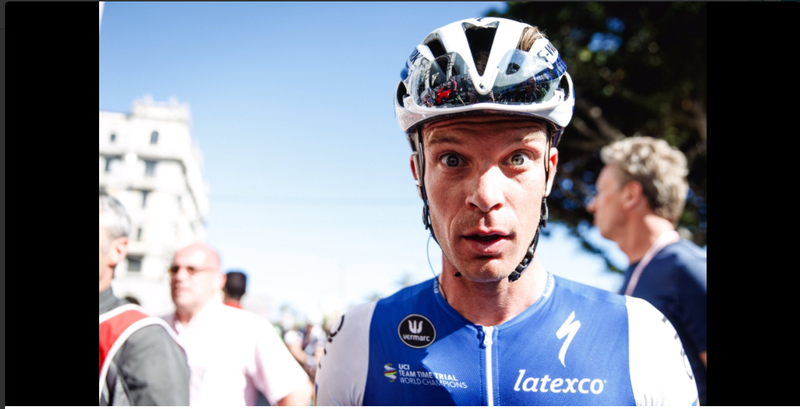 the joy, the champagne shampoo, the Keisse shock … it has it all. Gazzetta dello Sport: "Who will win this Giro d'Italia?" 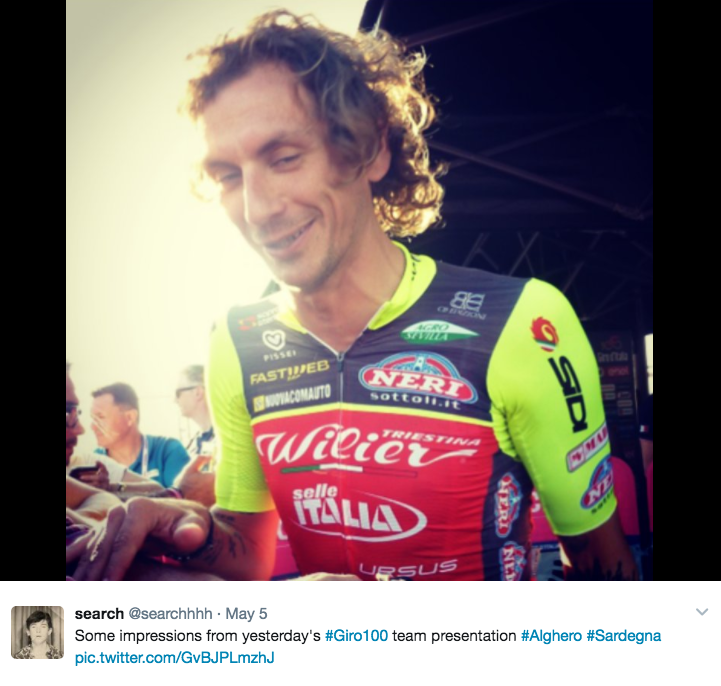 We’ve not seen much of him yet in the Giro, but there’s always room for ol’ Woodsmoke Thibaut Pinot in Tweets of the Week. 🗣 @ThibautPinot : "C'était digne d'une étape du Tour"
🗣 @JulienPinot : "Mission accomplie"
Okay, I’m not kidding now but I thought when I saw this tweet that they were interviewing some 12 year old fan. How young does Joe Dombrowski look??? The start of the Giro coincides with the summer of Hansen where he joyfully rides all three Grand Tours from start to finish. It was reported that Katusha told Alexander Kristoff had to lose a few pounds, which seemed a bit churlish. Nibbles and Aru seem to have made friends, now that they aren’t on the same team. Yeah, we know it’s not the Giro team but can you ever get enough of this?